The Caverns of Thracia by Paul Jaquays is a good example of why Judges Guild is remembered so fondly by so many of us who started gaming in the 70s. Published in 1979, Thracia is both a large dungeon and a campaign setting in its own right. While perhaps not large enough to be called a true "megadungeon," the four levels of the caverns are nevertheless expansive and filled with a wide variety of humanoid factions -- a few of them mutually antagonistic -- which contributes greatly to the feeling of dynamism the module evokes. This is a "living" environment that puts paid to the notion that old school dungeons are static places with monsters statically side by side without any interactions between them. Even more significant, from my perspective, is the diversity of environments within this module. Firstly, there is the Lost City of Thracia itself, a surface ruin that is the start of the characters' explorations. Beneath it lie four levels, several of which have sub-levels and special room complexes that are only reachable through certain areas within the larger levels. In addition, there are multiple connections -- shafts, chutes, stairs, and other more exotic means -- that contribute to the maze-like feel of the entire place. The Caverns of Thracia is very non-linear; there is no "right" way to explore its depths and no central "set piece" locations. This is a style of dungeon design that we just don't see anymore and that's a pity, because I think gamers are missing out on the unique pleasures of exploration that can only come when the dungeon environment itself is as much of a challenge as the monsters, tricks, and traps contained within it. I have a lot of fond memories of The Caverns of Thracia. 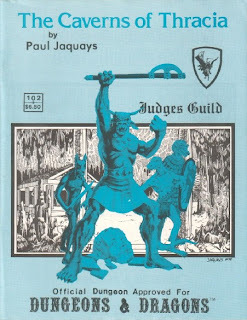 It was one of the few Judges Guild modules I ever played in my youth. My friend Mike's older brother had a copy and more than a few of our characters died horrible deaths while exploring its labyrinthine levels. But we had fun doing it, because the pseudo-ancient Greek atmosphere of the place, combined with its memorable encounters -- like the cult of Thanatos, the incarnation of Death -- spoke to our dreams of being Indiana Jones. I was eventually inspired enough to create my own Egyptian-flavored version of The Caverns of Thracia and, while that dungeon thankfully hasn't survived, it was an important moment in my education as a budding referee. I have Paul Jaquays and Judges Guild to thank for that; I wish similar lessons might be imparted to today's generation of gamers. I never owned or played Thracia, but I'll say this: I think that Paul Jaquays is one of the top-tier geniuses of D&D adventure design. I'm not surprised that it's his name attached to this. I keep meaning to throw up reviews of the M-series of modules on my own blog. Paul's module M5: Talons of Night has more mind-blowing ideas per page than any other D&D module I've come across. Jaquays is an underrated talent, IMO. You're on to something about the lack of exploration in modern adventure design. I've seen several comments to that effect regarding the current crop of 4e adventures, and it's a trend I'd like to reversed. Here here! Given the rigorous mathematical architecture of 4e, I should hope that DMs and designers will learn to make exploration and general "high weirdness," as I call it, the high-profile parts of adventure design. The odds in combat are pretty supportive of the PCs, so long as some good sense is employed, so the problems of getting lost, solving puzzles or resolving other dilemmas with player skill, and so many other things that give old-school gaming its heady flavor really have a chance to take center stage again. I'm seeing it as a kind of 'reverse Hickman;' 4e has all the room in the world to support this style of play (f'rinstance, the streamlined skill list moves a lot of things back into the realm of player cleverness and DM adjucation), but I don't think it will really catch on until some published material illustrates how well it can work and how much fun it can be. I've always wanted to try this one out. My group had a blast with Dark Tower and this seemed like it could have been a nice follow-up. Unfortunately it seems like a pdf version of the original was never produced, and I've had trouble tracking down a used copy. This is perhaps the best-designed dungeon ever published (with Jaquays' own "Dark Tower" being one of the other prime contenders), both in its map (which is really amazing and I don't think gets enough praise in your retrospective -- the extensive use of the third dimension and hidden sub-levels are light-years ahead of anything else released up to that point, and most things released since) and its content (other designers were doing "living dungeons" by this point - G1 and "Snake Pipe Hollow" (for RuneQuest) are good examples - but Jaquays takes the complexity up a notch, with a half-dozen different factions, plus three different "lost" areas). This module would be a major accomplishment no matter when it was released, and even moreso considering it came out in 1979 (really the dawn of the "professional era" of the hobby). 2) it's so well done that it doesn't serve as a good inspirational model for DMs to design their own stuff, which is (IMO) one of the main points of modules -- looking at most of the TSR modules (or other JG stuff like "Tegel Manor" and "First Fantasy Campaign") you come away with the feeling "I could do something like that, maybe even a little better" and are inspired to make up your own stuff, but with this module you come away feeling like "I could never match this" (at least I feel that way -- people with more confidence in their dungeon-design skills may feel differently (but I strongly suspect that if they do, they're wrong)). (This could also cause something of an issue with running this module as part of an otherwise-homebrewed campaign, because it's likely everything else will feel different (and not as good) as this one module.) A module IMO should inspire the DM to create his own stuff, not intimidate him out of trying to do so. I can't really blame Jaquays for this ("The Dungeoneer" shows that he was a hobbyist just like everyone else, he just happened to be way better at it!) but it does, I think, set something of a bad precedent, teaching DMs not that "you can do this too" but rather "you'll never be able to match this, so leave it to the pros" -- which, of course, became the increasingly-dominant philosophy through the 80s and 90s (and which we're just now finally beginning to shake off). Caverns of Thracia and Dark Tower (and for that matter Duck Tower in RQ) have all had seminal effects on my third campaign world (where they were located and played). Paul Jaquays is probably my favourite adventure designer (and a great artist to boot). One of the problems I have with a lot of 4E design is the idea of balance that seems so intrinsic to it's philosophy and which shouldn't exist in a more fully-realised world. There should be situations where the only sensible option is for the players to run away or seek another way around the problem. Dan, I believe that there is a version of Thracia for 3rd Edition D&D which may be more easily available. You would have to reverse engineer the stats, of course, but it's an option. Paul Jaquays remains one of my favorite adventure designers. In addition to Caverns and Dark Tower, don't forget his "forgotten" JG era masterpiece, Night of the Walking Wet aka Realm of the Slime God, which is quite easily available in the Dungeoneer Compendium selling for cheap on Ebay. Also, his Runequest work, mainly Griffin Mountain, is outstanding. I put Jaquays with Tom Moldvay (see B4 The Lost City and X2 Castle Amber) as the two most underappreciated game designers for D&D. Both had an incredible ability to stuff an immense amount of ideas into a relatively small product. From what I understand, the Necromancer Games 3.x version of CoT helps make the connections between levels and factions more explicit than in the JG version (I recently purchased, but haven't read this yet, since our DM was using both versions while running it for our group earlier in the year). I also understand that the NG version expands upon the original levels of the dungeon, although (again) to what extent I don't know (yet). Is anyone else out there familiar with both? WRT to Jaquays and Moldvay, I agree completely with Chris' comments: both designers seem to be largely forgotten by most contemporary designers as well as gamers, which is a shame, since many of their adventures are wonderful examples of adventures that can easily springboard into full-blown campaigns. I'll be the first to congratulate you if you do; it's one of the many lessons the old school still has to teach us about adventure design and I'd be very pleased to see it incorporated into newer games. so the problems of getting lost, solving puzzles or resolving other dilemmas with player skill, and so many other things that give old-school gaming its heady flavor really have a chance to take center stage again. I'd be very curious to see this thesis tested. My fear is that a lot of younger gamers simply have no experience of this kind of play and would consider it "unfair." Heck, I know a number of older games who've been so badly scarred by early encounters with jerky referees that they agree with the younger crowd. Unfortunately it seems like a pdf version of the original was never produced, and I've had trouble tracking down a used copy. They pop up on eBay pretty regularly and often go for very little money. The D20 version produced by Necromancer is quite good too. Just ignore the stats and revel in its glory. You're absolutely correct on this score. The maps are amazing and they contribute heavily to what makes this module the masterpiece that it is. but it does, I think, set something of a bad precedent, teaching DMs not that "you can do this too" but rather "you'll never be able to match this, so leave it to the pros" -- which, of course, became the increasingly-dominant philosophy through the 80s and 90s (and which we're just now finally beginning to shake off). I think you're on to something there. The irony, of course, is that this module actually did inspire me to try and imitate it and, while I failed by any measure, I did learn a lot from the experience. Personally, I'm of the opinion that having one's reach exceed one's grasp is a good thing, particularly in creative endeavors, but I suspect that you've identified a very reason problem that occurred as the hobby became more "professional" and the mentor culture of early gaming disappeared. The problem is wider than 4e. Indeed, 4e's design is simply, from what I can tell, dancing to the piper rather than calling his tune. The philosophical underpinnings of so much of contemporary gaming is built on a very different model than the literary one of OD&D and the early hobby. Bravely running away, we are told, is not "cool" and gaming is supposedly all about being cool. Very much agreed on both counts, although I would argue that the immensity of ideas contained within small products was pretty much the standard in the early days of the hobby. Most modules weren't even 32 pages back in those days, let alone 128+ and somehow they packed them with so many ideas that they put almost everything published in their wake to shame. I have the Nec version; by 3e standards it's very light on 3e stats since MM monsters are justed listed as eg "6 gnolls hp 6". Unfortunately my first attempt to run Thracia using C&C in a PBEM failed miserably, I'm thinking of using it with my tabletop group but it'll be a while. I'll tell you what, just to be devil's advocate: There's also D&D module M3: Twilight Calling, written by Tom Moldvay with a co-developer credit by Paul Jacquays. Personally I think that particular module is just awful, definitely the weakest of the Master M-series line. I'll also critique Moldvay's X2 (just read it over the holiday). I'm not as much a fan as some other people -- one grief I have is that it has a pre-scripted "climax scene/plot conclusion", I believe the first I saw in a published adventure. I didn't realize at the time how distinct that was, but in some sense it set the seeds for Hickman, 2E, etc. I never owned any of the Master series modules. Even at the time, I thought the very idea of characters that powerful was ludicrous and "not D&D" (to use the Words of Power). Much as I love X2, you're correct that it's a forerunner of the Hickman Revolution. There's much more of a story to it than, say, Isle of Dread and its conclusion even features a super-powerful NPC who can right all the "wrongs" done to the PCs in their explorations of the Castle. I try to overlook these things, but you're right to bring them up. I've been thinking about this lately and I guess I wouldn't call it unfair, but a play style, a level of detail issue or maybe a player knowledge/character knowledge issue. Case in point: I like exploration. I like to crawl from hex to hex uncovering 5 ants in one hex to the ancient red dragon in the next...replace hex with dungeon room, I'm good with that too. Now, ask me to map it, you know, where the DM says: "The corridor goes 30 ft straight ahead, turns right goes another 20ft straight and ends in a room" and the mapper has to draw out what the DM said and is held to what he drew. Meaning if he drew "turns left" instead of "turns right" the map would be screwed up and if the group tried to backtrack they'd be lost. That may work for some player/groups, but it bores me to tears. I made this realization while playing the Task Force Game Delta Force. It's a game that requires very precise and detailed small squad military tactics. I like tactics but not to that depth. I don't call that unfair, it's just, I guess the default play style of the game.